Day thirty of #RPGaDAY2018 asks us to share something you learned about playing your character. Another tricky one. I spent a lot of my youth being the GM, so I didn't really have a specific character. My longest running character from back then was actually someone else's who gave up playing their 8th level Paladin, just as a new player joined their group - me! More recently, I've played a lot of FFG's Star Wars, and we've played the main campaign of Tales from the Loop. The Star Wars game was a bit of a revelation to me. Especially playing in Star Wars - where you assume the majority of the game is going to be fighting. My character, Qedra, was a Zabrak who was Dark Side, but had joined the Jedi Academy to control his darker feelings and do good. Teamed up with a couple of Jedi apprentices, we had our fair share of fights and battles - especially after Order 66 and we had to go on the run, and into hiding, before joining the beginnings of the Rebellion. But, after a few over violent moments, I discovered as my character was becoming more Light Side, I was becoming more and more reluctant, and slightly repulsed, by my killing everything in sight. While I was a double lightsaber wielding powerhouse who could kill four stormtroopers in a turn, I started becoming more and more pacifist. The killing was becoming too much for my character, and me as a player. I was aiming to disarm, remove the threat, but reluctant to simply kill the villains off. It may have something to say about me, rather than the character. It'll be interesting to see how it goes with the new Star Wars game we've just started, as I'm playing a kid, who (along with a host of bizarre characters) has survived their ship crashing on a remote planet. Playing a lone character who has no attachment to the others, who just wants to survive and escape - to hide from the Empire - one so desperate to do anything to remain alive and hidden, is going to be a challenge. Day twenty-six of #RPGaDAY2018 continues the "12-months" weekender, this time looking to the future rather than the past, asking "Gaming ambition for the next 12 months". Again, that one's a short and sweet answer. If someone doesn't email me, or call, and say "Hi Dave, we've got the Harry Potter license and think you'd be the ideal person to develop the game", or say, "Hi Dave, we've got the James Bond license and think you'd be great to develop the game" (neither of which are likely to happen, but we can live in hope), then I guess I'm just writing my own thing. Not that that is necessarily a bad thing. I'm very passionate about WILD, and if nothing else crops up that may actually be a paying gig (because I could do with the income!) I'm hoping to get a sample of WILD produced - complete with illustrations and layout - printed as a POD example, so that I can show it to some publishers and try to tempt them into partnering for a Kickstarter. With the motivation that comes from deadlines, and the prospect of actually making money, I'm sure productivity on WILD will increase dramatically. I'd love to finally see it made. 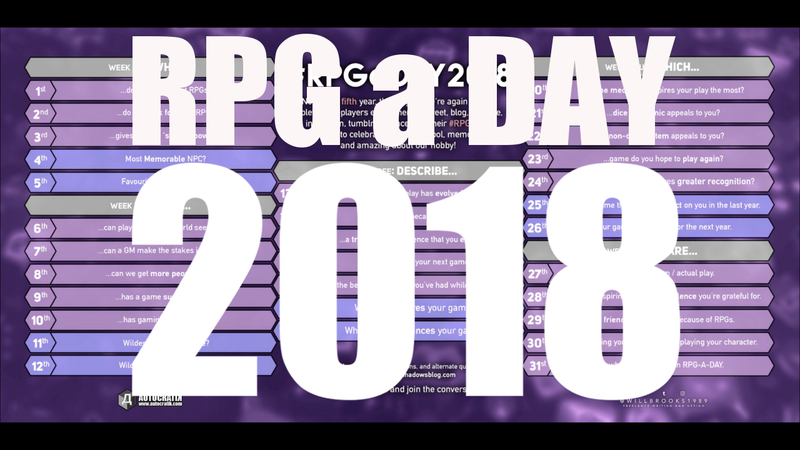 #RPGaDAY2018 - DAY 24: Which RPG do you think deserves more recognition? Day twenty-four of #RPGaDAY2018 is another remixed question kindly provided by M L Straus, who hosts the Youtube channel OG GM's Adventures. There's a link there that'll take you to his answers to the interview questions I asked those who supplied prompts for this year's #RPGaDAY. Be sure to head over and subscribe. Taking the original question "Favourite Game System" from way back on the 18th August 2014, the question has been remixed to become "Which RPG do you think deserves more recognition?" This can be interpreted a few ways - is it a specific game that you love but you don't think gets much attention, or possibly a system that really ticks all your boxes that you want to shout about? Or an old game that should be recognised for changing how gaming works? So many ways to answer! Maybe I'll do all three? Specific game that I love that gets overlooked - that's easy. I love Tales from the Loop, and it's getting a lot of attention at the moment with Twitch streams, and the upcoming Amazon series. But it's easy to forget another great RPG of kids investigating the weird that came out many moons ago - Little Fears, by Jason L Blair. It's a really cool and simple system, using D6s like Tales from the Loop, where the players are all children battling the weird. Unlike Tales from the Loop, Little Fears isn't about technology or robots, it's about real supernatural horror. Nasty horrors from Closetland. The kids fight back through friendship, and belief in themselves and more. The game got a complete revamp in 2009 with the Nightmare Edition, changing some of the background of the threats and giving it a new system, but at its heart is the same great game with brilliantly executed character creation, real tension, and a brilliant and improved feel that makes it almost like playing a game of Goosebumps or Are You Afraid of the Dark? A particular system that I want to shout about? 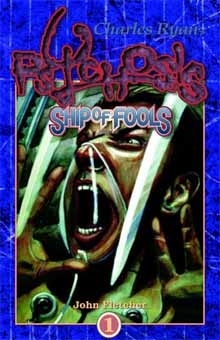 While I haven't played it, I did pick up Psychosis: Ship of Fools, simply because it uses a deck of Tarot cards as the main game system. It's an interesting premise, and I think one that heavily influenced Alas Vegas, where the characters all wake unaware of who they are, and in weird, seemingly unconnected locations. 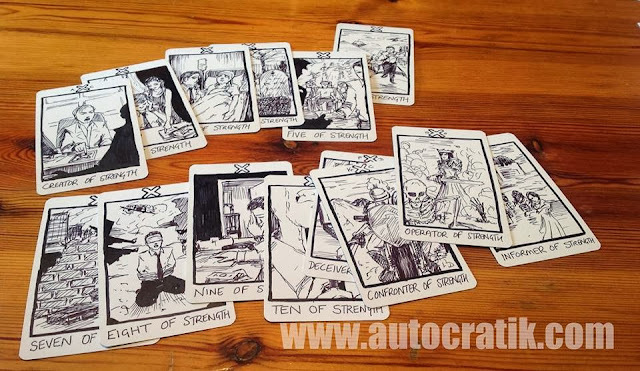 You split the tarot deck into minor and major arcana, with the minor arcana being used for task resolution (each suit represents a sort of ability or type of action) while the major arcana are used for cool effects. And that leads nicely on to the old game that I don't think gets enough recognition, as it's by the same publisher - Chameleon Eclectic. That would be The Babylon Project. While the game wasn't as huge as it could have been for an RPG based on the cool TV series Babylon 5, it did have a particularly great character creation system that has been a great influence on me. 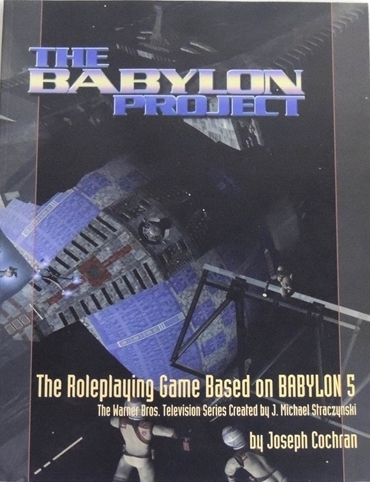 Rather than the roll or pick some values, and add skills and stuff, the Babylon Project was all about creating a background for the character first. You create each stage of the character's life, and as you go you pull out elements of their background that would be used to inspire which skills and abilities the character needs scores in. Great to see character creation done that way around - something I'm hoping to do with WILD, especially as the character's background is going to be vital in that game. There we go. That's the end of "Which week"... until tomorrow, stay multi-classy! #RPGaDAY2018 - DAY 23: Which game do you hope to play again? Day twenty-three of #RPGaDAY2018 asks "which game do you hope to play again?" So many games! So, so many! We've just finished playing an epic game of Tales from the Loop, running through the "Four Seasons of Mad Science" that is in the core rulebook, and that was a complete blast. Really enjoyed playing that, and look forward to playing Tales from the Loop again sometime in the future. I guess I could dial it right back on the way-back machine and think of the old games that I used to love and haven't revisited. I mean, I'd love to play WitchCraft again, but I'd be tempted to run it with cinematic Unisystem instead of the full "classic" Unisystem. I kinda miss playing urban fantasy horror. The Mage/Kult/WitchCraft game that we played over many years was awesome. Further back, I'd love to play James Bond again, just to see if it is still as much fun as I remember. Still one of the biggest influences on me, along with the Ghostbusters RPG. I still have the complete set of the Bond RPG (minus the mini-games and the Assault desktop battles game) and it's still a gorgeous work. I started thinking about merging the system with Vortex a while ago... maybe I'll give it another tinker sometime. I did have a weird desire to reread Star Frontiers, going way back to my start of gaming back in the early 80's. I wonder how that holds up after all these years? There we go, what do you hope to play again? Until tomorrow's question, stay multi-classy!! #RPGaDAY2018 - DAY 21: Which dice mechanic appeals to you? Day twenty-one of #RPGaDAY2018 is all about dice, dice baby! A question that is a remix of an ancient question from the very first year of #RPGaDAY, back on the 9th August 2014 we asked about your favourite dice. This time, that question has been remixed by M L Straus who hosts a Youtube channel called The OG GM's Adventures. I fired my usual interview questions over to him and he answered with a video! Fantastic! Thank you for the remix! As I mentioned, the question that once was "Favourite Dice" has now become today's question, Which Dice Mechanic Appeals to You? Cool. Thank you! Don't forget to check out the OG GM's Adventures Youtube channel and click subscribe. That's actually pretty tricky. I can't think of any single mechanic that appeals - probably something simple. The simpler the better in my opinion. That said, I'd never really considered probability curves until I started designing the Vortex System for Doctor Who. It's a weird one, as I was a massive Unisystem fan (and still am) but the range of the roll on a single D10 is the full 1-10, with the probability being equal for each result. When working on Doctor Who I kinda wanted success to be a little easier, so I had to look at what the average roll would be - using a single die doesn't really give you an average roll does it? I dunno. However, if you take two dice, you immediately get that lovely bell-curve of probability for the result. Nice! It meant things were certainly more predictable for working out the successes and difficulty levels. I'm not saying I got them right, but hey... they seemed to work and people liked it. Until then - Stay multi-classy! #RPGaDAY2018 - DAY 20: Which Game Mechanic Inspires your play the most? Day twenty of #RPGaDAY2018 sees the start of "WHICH"-week, where all of the prompts start "which"... Today's question was kindly submitted by Ricardo in Brazil - you can find him on twitter as @f5kn, and it's a biggie - "Which game mechanic inspires your play the most?" Thank you Ricardo! Great question!! 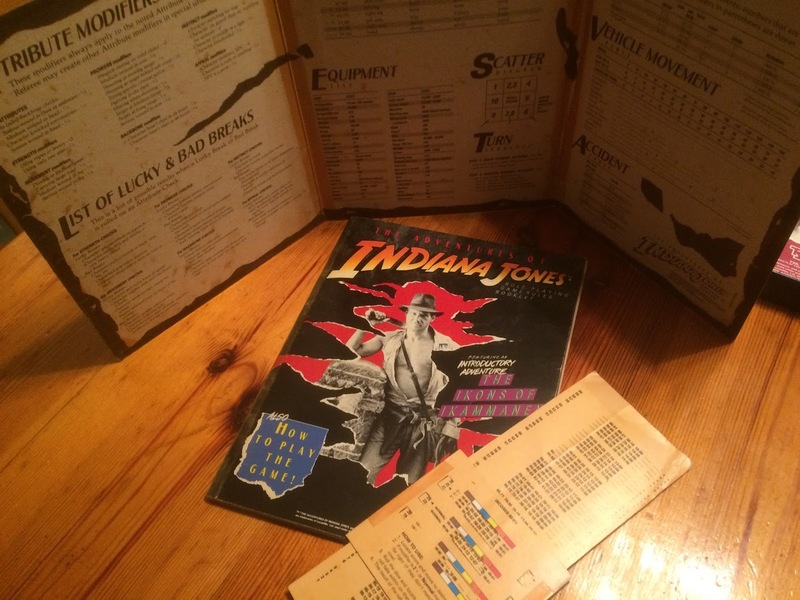 TSR's Indiana Jones RPG with its slide rule to work out how well you'd succeeded or failed. For years, especially coming from the old school era of gaming, everything you did with a dice roll was simply "You Succeed" or "You Failed". I think it was either the Indiana Jones RPG by TSR (yes, that legendary game!) 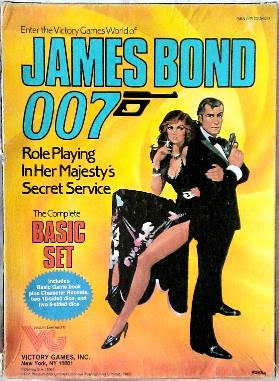 or the James Bond RPG that first exposed me to the concept of succeeding/succeeding well/succeeding really well, meaning that your roll produced levels of success. Since then, I've really appreciated games that added some colour to the results - it means that your game isn't just hit or miss, win or lose, fail or succeed. For Doctor Who I adopted a cool idea which was to add the "AND" and "BUT" rules, so you could succeed ("and" something extra good happens, or "but" something doesn't go as well as you'd hoped), or failed ("but" something advantageous happens, or "and" it gets even worse than you'd feared). Star Wars (the FFG one we're currently playing) has a similar thing with its "advantages" and "threats", "triumphs" and "despairs" on those wacky coloured dice. 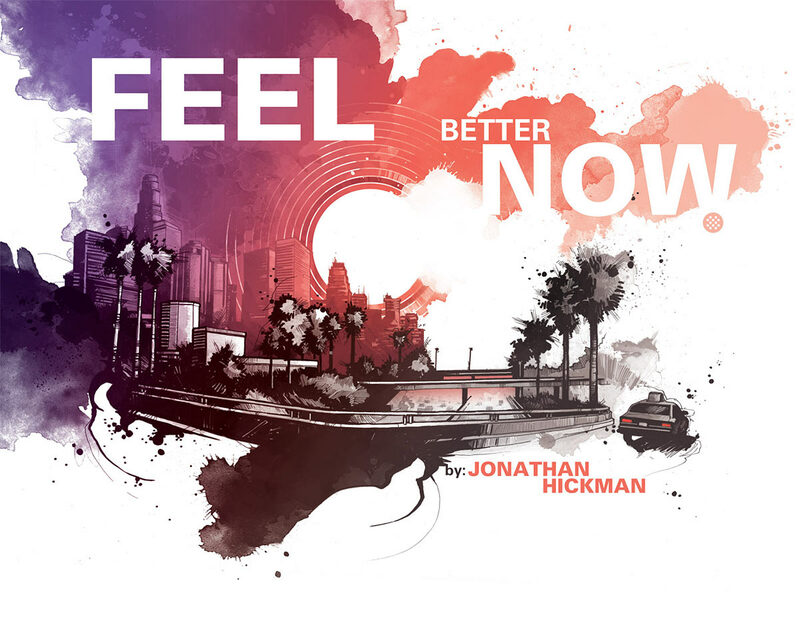 #RPGaDAY2018 - DAY 19: What Music Enhances Your Game? Day 19 of #RPGaDAY2018 is a companion to yesterday's question about inspirational art. Again, supplied by Richard Brewster (check out his cool blog Batjutsu for more about gaming!) this asks about what music enhances your game? I must admit, I don't really use music during the game any more. 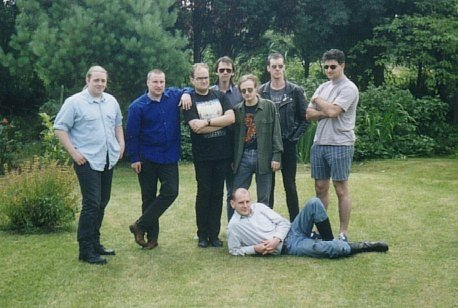 We used to a lot as teens, playing D&D and Traveller while listening to Jean-Michel Jarre, Mike Oldfield and other weirdness (not forgetting the Pentateuch of the Cosmogany!) We kinda went off listening to music during the game. Mostly as the current game involves some Skype involvement which is tricky with background noise. If we did have music going, we'd be listening to Simon Stålenhag's soundtrack to Tales from the Loop, or his other electronica. Or the cool soundtracks to Stranger Things. Though as we're just about to return to playing Star Wars, there's only really one set of soundtracks you need for that! Like yesterday's post though, when it comes to WILD, I have a whole host of music I listen to that inspires me while I write. Most of it is the complete Nine Inch Nails catalogue, to cool weirdness like Poe's Haunted album, Trent Reznor's film scores, and early Thirty Seconds to Mars. I sometimes have it on shuffle so that random tracks from David Lynch's audiobook of Catching the Big Fish pops up in between tracks to remind me about consciousness and creativity. #RPGaDAY2018 - DAY 18: Art that inspires your game. Day eighteen of #RPGaDAY2018 is the start of a weekend all about art and music, and how they can inspire and enhance your game. Both of the questions this weekend were provided by Richard Brewster, who hosts a great blog called Batjutsu which you should definitely check out! The first part of this art and music weekend asks for "Art that inspires your game". Again, there are a couple of answers to this one. If it's the game we've just finished playing, that's easy as it's just a case of checking out the amazing visuals of Simon Stålenhag's fantastic paintings, as we're just finishing up our Tales from the Loop game. 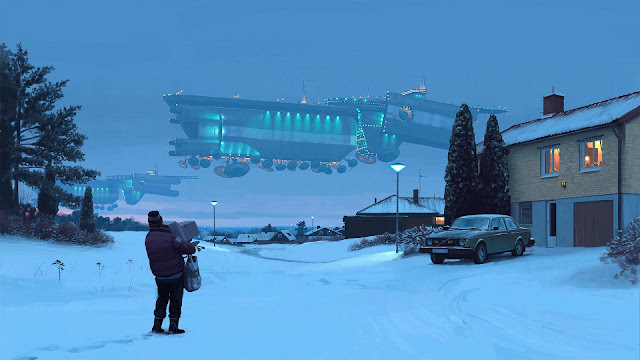 Art (c) Simon Stålenhag - I mean look at it, it's freakin' beautiful and inspiring! I can see why Fria Ligan decided to use Stålenhag's artwork for a roleplaying game. Every image seems to tell a story and ask questions, with an amazing juxtaposition between 80's tech (see the guy carrying the old computer monitor and the Volvo parked in the drive) and cool, crazy sci-fi. The other way to answer this question is to look at the art that's inspiring me when I'm working on WILD. I've got one of those wacky Pinterest boards dedicated to things that I see and flag as inspiration for WILD. One of the first inspirations artwork-wise for WILD was looking at the cool art of David Despau. 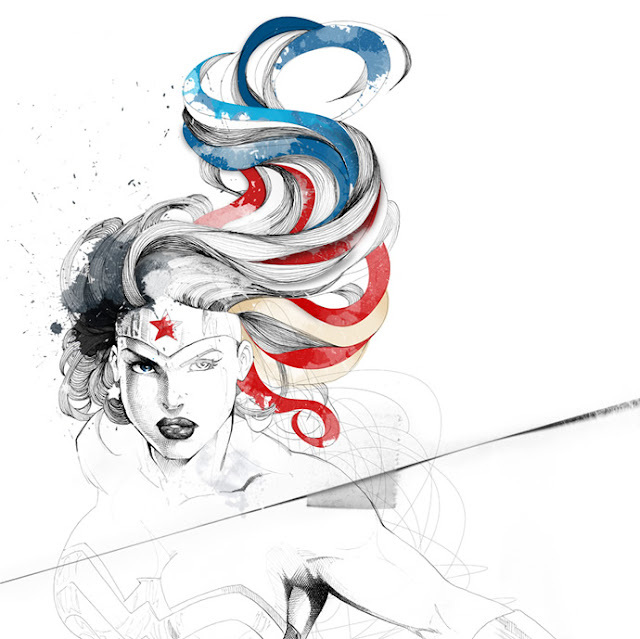 I just always liked the way his artwork is blend of fine line work, with energetic splats and half finished lines. It's simply beautiful. I really want to keep the splat look in WILD. I don't know if it's because there are the echoes of the Rorschach ink blot tests, or just the energy and dynamism that makes you feel like there's action and excitement in the game. That splatty feel, with cool graphics on white, meant that Jonathan Hickman's graphic novels (Nightly News, Pax Romana) appealed, but this image from a graphic novel that has been stewing as long as WILD has, used to be my desktop wallpaper for months while working on WILD. That is just amazing and perfect. I'd love to see the final product one day. #RPGaDAY2018 - DAY 17: Describe the best compliment you've had gaming. Day seventeen is one of the most positive questions we've had for #RPGaDAY. Taking the original question from 31st August 2016, Fabien (better known as "Fabulous Fab's") from the Youtube Channel AnythingTodayNet changed the original question of "Best advice you were ever given for your game" and asks as part of #RPGaDAY2018 for the "Best compliment you've had gaming". I must admit, I don't think I'm a very good player, and I don't think I'm a very good GM any more. I may have hit my peak GMing in the mid-late 90's, but I don't think I've got it in me any more - not without some practice. I've had some nice compliments about my writing for the games, though. Getting Best RPG at the UK Games Expo 2010 for Doctor Who, and the Gold ENnie for Best Family Game for the 11th Doctor edition of Doctor Who was awesome, and unexpected. I just hope people enjoy what I've written, have fun playing the games, and I just hope it makes the world a little better in its own way. I'm looking forward to hearing about the compliments you've received from gaming! #RPGaDAY2018 - DAY 16: Describe your plans for your next game. Day sixteen of #RPGaDAY2018 asks "Describe your plans for your next game". I guess I'm lucky to be in a position that this can relate to two different things. One, the game we're planning on playing next as our Tales From The Loop game concluded this week, and the other the game I'm working on. Actually playing, that'd be Star Wars. 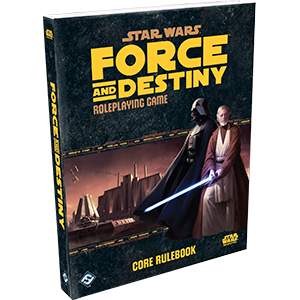 We had such a blast with Star Wars (FFG) last time with a two year long campaign that spanned the Clone Wars through to the formation of the Rebellion, that we felt we had to go back to that Galaxy far, far away. From what I can tell our next game is one of survival - a crashed ship on a desolate and uncharted world. I've an idea for my character, doing something a little different from my twin lightsaber swinging Zabrak from before. Really looking forward to it. As for what I'm working on, I'm still working on WILD. It's been many years, but what started out as a game heavily inspired by Inception, Dreamscape and Elm St, it has evolved to become something huge. At its core it is still a game about dreamshare technology and the unlimited worlds of dreams, but it now has real world plots, Lynchian elements, secret research programs, investigations and the strange. It is evolving and growing, sometimes faster than I can keep up with. I've rewritten and redeveloped the core of it many times, and now it really is something I'm starting to feel happy with. And at the beginning of the year I had a moment of revelation of how the books will be structured - the parallels of background, rules and illustrations flowing together in echoing narratives. 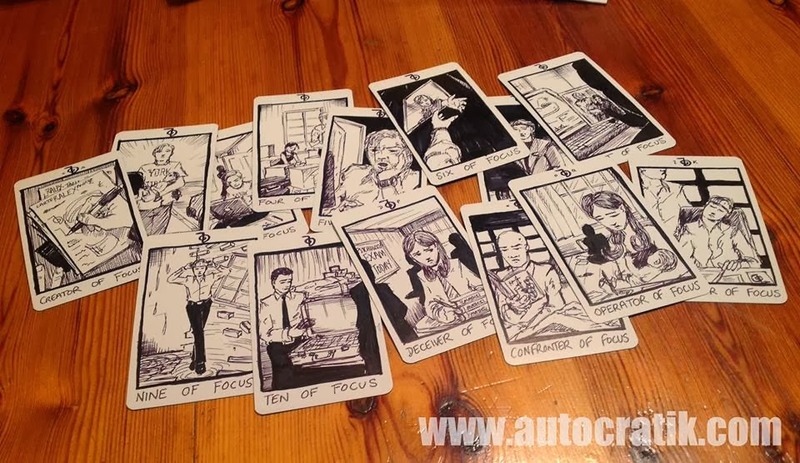 I'm hoping to have mocked up the first couple of chapters before the end of the year to show the concept and execution. Maybe I can show it to people, get someone to help with a Kickstarter or something. It'd be the motivation I need to get it completed. #RPGaDAY2018 - DAY 15: Describe a Tricky RPG experience you enjoyed. Day fifteen of #RPGaDAY2018 is another remixed question. Taking the original question from August 22nd 2017 of "Which RPGs are easiest to run for you? ", Christophe who hosts the Youtube channel Pilule Rouge JdR suggested flipping that question around while still keeping it positive - to produce "Which RPGs do you enjoy running even if they are difficult for you?" Great question, Christophe, and Anthony took that suggestion and opened it wider so it wasn't asking for RPGs, but a particular RPG experience. So today's question, with many thanks to Christophe, is "Describe a tricky RPG experience that you enjoyed". Please go check out the Pilule Rouge JdR Youtube channel, and subscribe. There are times when the group gets a little carried away - lost in the moment. It's understandable. Our games have shifted from being all about action and violence to being often quite intense games of story and emotion. Sure, we still have our times of hilarity, and we come up with some stupid plots - but a recent game of Tales From The Loop had us all feeling a little uncomfortable as we found ourselves lost in a shared version of our unconscious. We helped the villain of the story - not battling him in combat, but helping him resolve his issues of a violent family. While doing so, we were exposed to elements from our own characters' unconscious - my character had to relive the car crash that killed his mother, another discovered a sister they had that had died at a young age that they'd forgotten about, while the last had to deal with their feelings of being ignored by the rest of their family. It was pretty intense, emotional and a little unsettling, but it really made me feel like we were telling a great story. The stakes were high, and without such emotional resonance we wouldn't feel as attached to our characters or as engaged in the story we're telling. #RPGaDAY2018 - DAY 14: Describe a failure that became amazing! Day fourteen of #RPGaDAY2018 asks us to describe a failure that became amazing. I'm expecting a whole host of epic tales of disaster to be shared today. Today's question, however, was provided by Richard Brewster, who hosts a great blog Batjutsu that you should really check out! I particularly love the pie-charts!!! Like the other folk who submitted questions, I sent him some interview questions and he kindly responded with a video that you can see below - have a watch and subscribe! I guess I'd better answer the question. I know I've already mentioned this, but the most epic failure I've had recently in gaming was the FFG Star Wars game we finished a few months ago. We'd prepared for days on a planet that was a key location to the rebellion's ship repair facilities, knowing that the Empire was soon to arrive. And they did. I had one of those Delta-7 Aethersprite ships and I decided to hang in orbit and take out a few fighters before the ground assault began. I managed to take out a few, and I continued shooting TIEs out of the sky as the main ground forces landed and started their way toward the base. I rolled really badly, and the TIEs got lucky, blasting my ship into pieces. Luckily, I was in atmosphere, so I popped the cockpit and stood on the nose, using my Force powers to guide its descent - aiming the crashing ship straight at one of their huge, Imperial tanks. At the last minute, I jumped off (boosted by the Force), and landed on another tank - igniting the lightsaber and starting my attack on the troops as they emerged from the top hatch. #RPGaDAY2018 - DAY 13: Describe how your play has evolved. Day thirteen of #RPGaDAY2018 and the start of the DESCRIBE week. The first question of the week is "Describe how your play has evolved". I think it has evolved quite a lot as I've hopefully matured as a player, and as a person. As a teenager, all we really wanted to do was basically be murder-hobos as they call it. We'd go into dungeons and kill the monsters, take the treasure, get more powerful and do it all over again. Even in the games I ran, that was basically all we did. I used to run Star Frontiers, and the group went into epic battles against the Sathar empire, powering up in suits like "Gavin the Walking Battleship" from the Travellers comic strip. Ghostbusters and James Bond really saw the start of things starting to change, especially with Bond - there was a plot and a story... and most of the time the plot advanced whether the players intervened or not. The villains weren't going to wait around to be stopped. They had a schedule and if the players arrived too late, the villains succeeded. This was a hell of a revelation at the time. 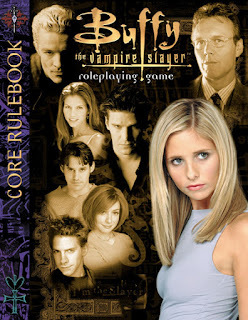 After that, I had a break from gaming and it wasn't until I went to University that I got back into it through playing original Vampire: The Masquerade. 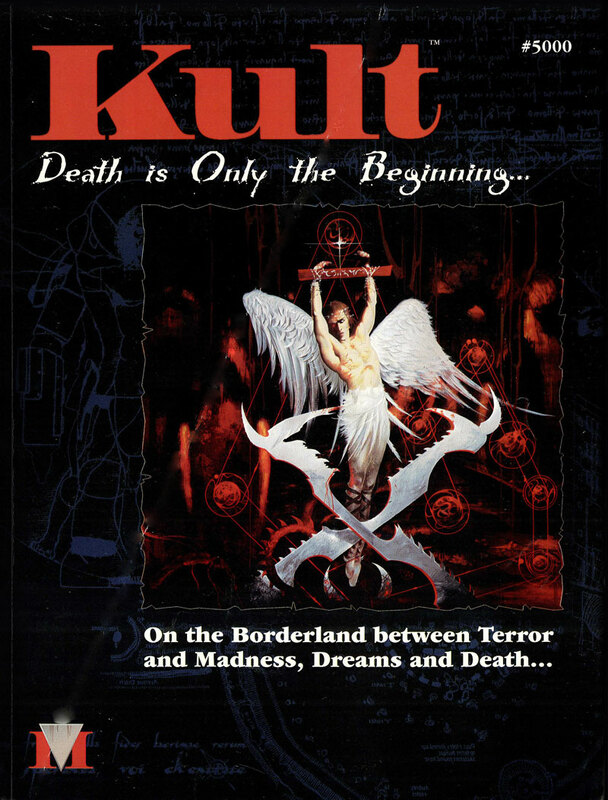 It was certainly more story-driven than anything I'd played before and we quickly progressed through Mage, to Kult, then to WitchCraft. Games we've been playing recently like FFG's Star Wars, Tales from the Loop, and so on, have all been very plot focused. We've lost the desire to "power up" our characters, and strive to tell a great story with exciting moments of action rather than just destroy the villains. Part of me wishes I could go back to the old D&D games and say to myself "you know, this is how it could play..."
Day twelve of #RPGaDAY2018 is the second half of WILD Weekend, asking "Wildest Character Concept". What is the weirdest character idea you've had for a game? Weirdest character concept I encountered was for a game of Kult I was GMing. All of the characters were goth-teenagers who hung around the goth clubs in London, getting drunk and messing with arcane forces. So, when a new player decided to create an eight-year-old orphan who'd escaped from a research facility and had psychic powers. I mean, interesting concept, but how a group of sulky, drunk, late teen goths would bring an eight-year-old into their group... a bit tricky. I'm sure we'd have made it work, but alas, the player generated the character and never returned, and the game never really got underway. 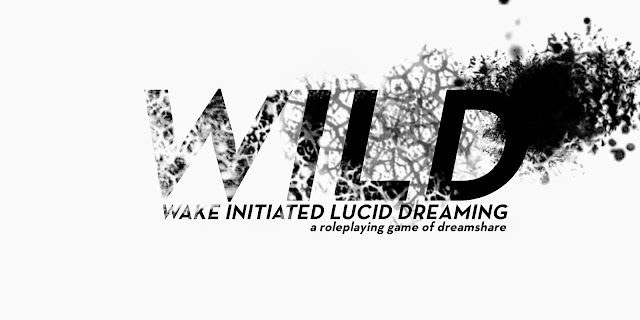 Thank you for humouring me for WILD Weekend, as a shameless way of keeping the name alive while I continue to work on WILD - the RPG of dreamshare and weirdness. I think most of my characters have had pretty normal names. In my youth I had very little imagination so a lot of my characters had names from movies and TV series. I remember both George McFly and "Wild Bill" Kelso were characters in various Call of Cthulhu games. Names are always the hardest bit for me when it comes to characters. Not very "wild" were they? I remember a couple of character names from my old gaming group - especially Jock Duckbar-McClan-Fagwaters, and Squidroon Dirk. Maybe it's a maturing of my gaming style but I find the hilarious and silly names of my youth destroy the suspension of disbelief and take you out of the "gaming moment". I'd be interested to see what everyone else comes up with for this one! #RPGaDAY2018 - DAY 10: How has gaming changed you? Day ten of #RPGaDAY2018 asks "How has gaming changed you?" Blimey. Don't hold back at all with the questions, will you? Well, if I hadn't been playing tabletop RPGs I wouldn't have as many friends as I do now. I'd have had my "best friends" that I had at school, who used to hang out and play video games, but I don't think our little circle would have been as close without sharing the epic stories of battle that bond a group together like playing D&D. And, as I've mentioned before, I got my first job thanks to roleplaying. Sure it was working for Nature Conservation for the county council, doing their cartography. But the boss at the interview said it was down to me and one other chap, and I tipped the balance because he knew I roleplayed - which meant I could problem solve, think outside of the box, and work in a team. So without tabletop games, I'd have probably been unemployed, have very few friends, but unimaginative and uncreative. I wouldn't have had the group of friends whose adventures in games inspired me to try drawing comics of their exploits, so I would never have tried to draw comics, so I would never have gone into comic publishing for a short while. I have no idea what I would be without gaming!! #RPGaDAY2018 - DAY 9: How has a game surprised you? Day nine of #RPGaDAY2018 asks "How has a game surprised you?" I love it when a movie or TV series I'm watching is unpredictable. So much entertainment these days is formulaic and rehashes the same old ideas over and over again. Luckily, tabletop gaming is very unpredictable. Players can go off on a tangent and before they realise it, they've gone down a path that they were not expecting leaving the other players sitting, staring in shock. However, the biggest surprise we've had playing was a crafty bit of planning from the GM of our Star Wars game. We'd been told we were playing Jedi during the Clone Wars, and after a few months of playing we'd been researching cool ancient Jedi artefacts, and trying to stop the influence of the Dark Side on fellow Jedi apprentices. The GM had different ideas of course. Middle of a mission to an icy planet to rescue a few Jedi who had gone missing, the twenty clone troopers escorting us received an order from Coruscant. Order 66. Now we had twenty clone trooper turning on us, blocking our way off of the planet, with a further forty descending in ships. We were doomed. We survived, but it was a close thing, but great proof of a cool plot twist that changed the dynamic of the game. That was cool. I could probably list some more, or times when a game's actual content surprised me, but I think that'll do for today! #RPGaDAY2018 - DAY 8: How can we get more people playing? Day eight of #RPGaDAY2018 asks "How can we get more people playing?" That reminds me of a conversation I had over emails many, many, many years ago with Chris Birch, head of game publishing juggernaut Modiphius. This was way back when Conspiracy X 2.0 had just come out, and he hadn't started in game publishing. He dropped me an email about the game and we started chatting, and one of the questions he asked was "how do you think we could reach more people with the hobby?" How could we get more people, especially kids, playing roleplaying games? Of course, this was before Dungeons & Dragons had its second (third?) renaissance and kids just weren't exposed to tabletop gaming like they are now. The cover of the original printed pitch to the BBC. After a few emails, we decided that the best way to get kids playing was to produce a game that tied into something cool that the kids were enjoying at the moment - of course, I mentioned Doctor Who and Chris responded with "well, I know who to talk to at the BBC"... A few months later and we, along with Angus and Dom and their newly formed Cubicle 7 Entertainment were sitting nervously in the BBC's offices discussing our ideas and a new game was born. Cut to today and kids are watching Critical Role, Shield of Tomorrow, and so many streams of cool games - and Dungeons & Dragons doesn't have the stigma it used to. The games industry seems to be growing again. I honestly don't think there's much we need to do except to ensure that new players are welcome. Just like most fandoms, there is a negative element that we should be fighting. Anyone should be welcome to play. #RPGaDAY2018 - DAY 7: How can a GM make the stakes important? Day seven of #RPGaDAY2018 - a week in already! Today's question asks "How can a GM make the stakes important?" I dunno if that's really a GM task. In my experience, it's about the players. If they've invested in their characters, really got into playing them, then any threat to them will feel real and make it feel more important. I've played a lot of games where I haven't really cared about my character, and found myself throwing the character into situations that seem dangerous - they've usually worked out in the end, and sometimes even saved other characters. But, as I didn't really care about the character to begin with, it didn't really matter. It didn't feel like there was a risk. Thankfully, in the games we've been playing recently - especially the Star Wars and Tales from the Loop games, I've felt more attached to the characters. When they're in danger, I care about their survival and the survival of the rest of my group, and any threat they are under feels real. The danger is there, the stakes feel high as the town they're trying to save, the NPCs in danger, the information they need to retrieve that'll help the cause... they all feel urgent and important as we, the players, are invested. Strangely, Loop is an odd case when it comes to this. We're having a few issues with the "you can't die" element of the characters (what with them all being kids). With the threats in the game escalating with the arrival of killer robots, velociraptors and mind-controlled enhanced thugs, we feel like we're in more danger than we really are. We keep forgetting that we can't actually be killed in the game, and wonder how a teenager can really hope to face these dangers. I guess that's a roundabout way of saying that the players and their investment in the characters and the world will make the GM's job of making the stakes feel important ultimately pretty easy. I hope that answers the question! Until tomorrow - stay multi-classy! #RPGaDAY2018 - DAY 6: How can players make the world seem real? Day Six of #RPGaDAY2018 and it's a bit of a cryptic one. Starting off the week of HOWs, the question is "How can players make the world seem real?" My advice is to have a totem, to check to see if you're in the real world. Also, keep an eye open for Déjà Vu, as that means they've changed something in your simulation. Otherwise, as I said, it comes with time. The players and GM will gradually build the world over time - filling in details, adding cool NPCs, and making the place feel more real over time. It's a cycle of Creation and Perception. You create your world, perceive it, and create upon that perception. You'll gradually build a cool setting filled with awesome characters, locations and events that'll feel fully immersive as the games progress. Hope that answers that one!